Versatile machines that are adjustable and performs many essential sheet metal operations using one motion to clamp and fold. 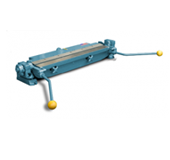 The machines are used for S Clips and Drive Cleats, forming sharp locks on edge of sheet metal for double seams, open locks for wired degrees, flanges of various degrees, and single or double hems. For radius bends, short run production a quick set back gauges is included. Steel floor stand is available as separate accessory.